This article is a collaboration between La Gente staff writers, Maritza Geronimo and Kristian Vasquez. Este es México. La de este país es una historia de equivocaciones. Pero hasta ahora, siempre de los que equivocan son ellos y nosotros [Indígenas] somos la equivocación y quien la paga. On November 21st and 22nd, a father and organizer of the Ayotzinapa 43 movement raised consciousness to the mass kidnapping of the disappeared students. 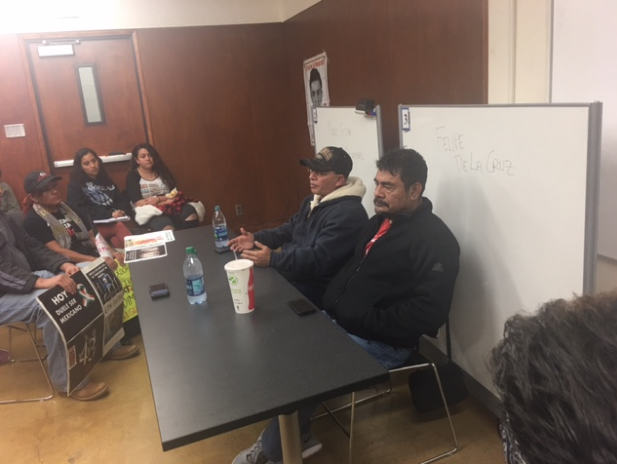 They spoke of what took place on September 26, 2014 in Iguala, Guerrero, México, and the aftermath of what was to come; it was a caravan which would spend two invaluable days at UCLA. 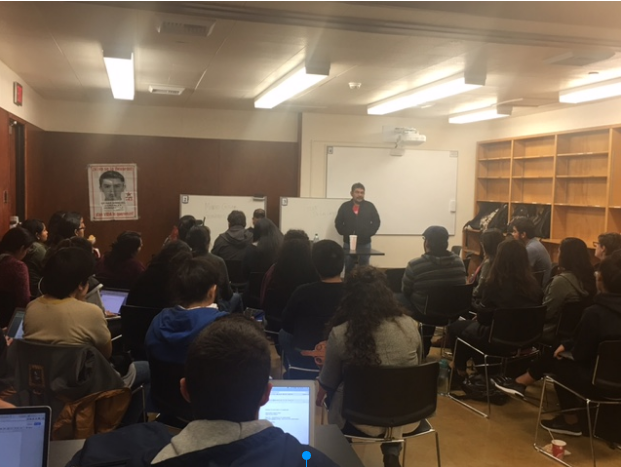 From student-led discussions, questions, and comments and a class led by Chicano Historian Juan Gómez-Quiñonez, El Movimiento Estudiantil Chicanx de Aztlán (MEChA)–supported by the Chicana/o Studies Department–organized this important outreach/plática to take place. The Organizers shared their testimonios of the students from Raúl Isidro Burgos Rural Teachers College of Ayotzinapa. These students were leading a bus to protest and remember the 1968 Tlatelolco Massacre in la Ciudad de México. The students were intercepted by Iguala municipal police, were then taken, detained, and handed over to a drug organization. Speakers Felipe de la Cruz and Mario César Gonzalez Contrera discussed corruption and the reality of state sanctioned violence against the Indigenous people of México. After the events of September 26th, Indigenous Resistance was pioneered by parents, families, and communities. 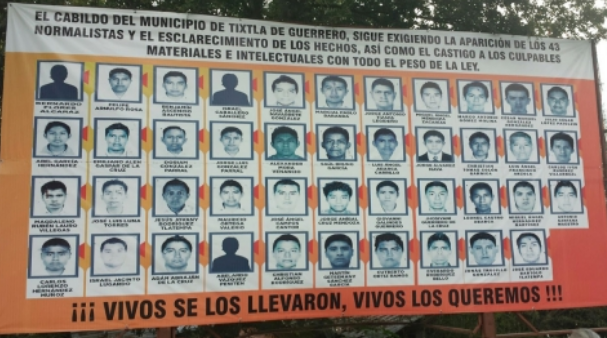 The Ayotzinapa 43 lived on. This is for them, their parents, and everyone. This is the consciousness needed by the movement to find the 43. Below you will find our personal stories, experiences, reflections, and frustrations. Siento su dolor, siento su resistencia, siento la desaparición de los 43. Siento como si fuera mi cuerpo, mi familia, mi sangre—y sí lo es. The 43 went missing in México, but the pain was and must continue to be felt everywhere until they are found. The sky feels mi gente’s pain; we cry as one. I hear the crowd count off, “uno, dos, tres, cuatro….” Alone with my camera in hand, I run through the crowd. I see the distress on all the brown faces as they yell for justicia. Pictures of the 43 young men plastered on poster boards and in them I see myself: an 18 year old college student with a drive to learn and uplift my community. Yet our struggle is not the same, for I am here standing safely while they are missing. Pero su dolor es mi dolor. I carry that pain with me for the next two years. Not a day goes by that I do not remember the 43. I am standing outside the UCLA guest house awaiting MEChA’s two guest speakers: Felipe de la Cruz (representative for the families of the 43) and Mario Cesar Gonzalez Contreras (a father of one of the 43 missing students). “It has been two years, but it feels like just yesterday. We are tired, but not ready to give up,” they share with a crowd of students. I am translating for them tonight. I translate the words of a father’s broken heart and with every syllable that comes out of my mouth I feel his heartbeat. Don Mario recounts a personal narrative, one left out of most media outlets, where he recalls the last time he heard his son’s voice on the day of September 26, 3:35 pm. He looks at us students and says, “I have gotten the opportunity to speak in front of many crowds, but by far this college tour has been the hardest. I look at you all and see my son. Many of you are his age. Many of you have similar characteristics.” The crowd is silent. I am hurting yet quickly trying to formulate words for others to understand. It has been 2 years: a wound left open, a wound being continuously cut—sangre corriendo. The government’s hands covered in blood, come in for a handshake. Creen que no sabemos. They think they can continue to erase us—pero ya basta. A nuestra gente les quitaron tanto, que les quitaron el miedo. Entonces miremós al gobierno a la cara y recordarles de quien es esta tierra. This lyric—from the anarchist punk band de México, Desobediencia Civil—resonates with the powerful, beautiful, and resilient 43 Indigenous students who were taken from all of us. With the rise of activism from students—of expression and direct-action—state sanctioned violence, which presents itself with the mass kidnapping of these students, speaks volumes. It reminds us all of the importance of protest, of the struggle for real transformation, and its reactive counter from the oppressive nation-state and their respective agents. These 43 students stood up against what they perceived as wrong, against systems that oppressed, exploited, and marginalized their community. They fought, as Indigenous people of the land, for their liberation and self-determination to resist, exist, and emancipate themselves. Education, often considered a privilege, is a necessity for all people, a right for all people. 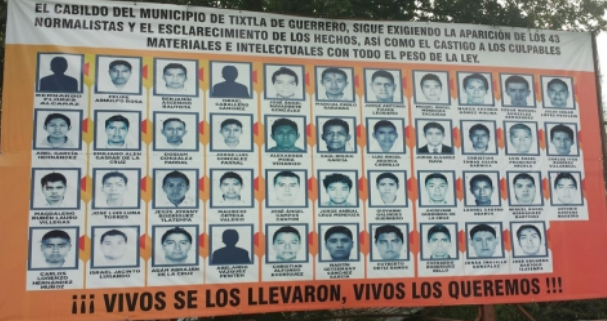 Education was fought for by the Ayotzinapa students: 43 sacrificed their lives for such a struggle. I’m reminded constantly of the brutal, persistent, and unpleasant effects that have ruptured la tierra de México. The conditions of México have been in turmoil ever since the first wave of colonialism in 1492 and its later inception as a nation-state by the Spanish Empire, further complicated by México’s independence and what Mexican anthropologist Guillermo Bonfil Batalla called the “Imaginary México.” But this gets spoken about differently in many and all spaces; between classes, family, institutions, the government, and so on. We see either its necessity, its benefits, or maybe (when we are critical) we perceive the complexities which birth the motions at work today. Yet, we must always remember where México is grounded: who inhabits the lands (and always has), who works the land (and experiences first-hand the ills of modernity), and who breathes the air their ancestors did before 1492. The remnants of Mesoamerican civilization and its ongoing survival—these are the Indigenous who suffer the most and the imperative to see through their eyes is exponential. We must read our history as Raza and see that across Abya Yala we are all connected—but some of us experience drastically different things (from different regions and upbringings), and because of colonialism las Indígenas de esta tierra are subject to subjugation far beyond what we know here in the United States. With the rise and stabilization of modernity, with its catastrophic results, the situation we bear witness to in México is exemplified by what happened—continues to happen throughout México—in Iguala, Guerrero. The Indigenous people continue to suffer under the hands of colonial legacies and modernities and are erased slowly from the social fabric of our consciousness as we choose to forget. Students like the 43 wanted to mobilize against this reality. The lost, they bleed through our neglect. The lost, they incite inside many of us a fire that never burns. The lost, they must never be forgotten—or we will have given up the Indigenous struggle, and the struggle for our entire Raza’s liberation. Triste soy por toda mi gente que sufre este tiempo de corrupción. This is violence, and this is injustice. As I turned my eyes and ears to the stories bled by a vulnerable father, I felt the pain for the 43 families, of a community who can’t find 43 young students. They paid with their lives for an education, which was evolved by parents to a grander and global movement for the future of México. We must all struggle for their lives, for their vision, and for the struggle of Indigenous people in México. Indigenous people have been at the forefront of our liberation, yet too often it is us who continue to neglect them. Somos de su sangre—pero no lo queremos admitir—escucha a tu corazón temblar por sus llantos—y verás que son tus llantos también. The movement these parents started must continue to be heard—if it takes another 2 years; let it be 2 years of growing cross community organizing, 2 more years of building consciousness—but do not let 2 more years be silenced. It is our time to recognize our place in the fight for liberation of nuestra raza, which can only truly begin once we realize the 43 students somos todos. We can no longer look at the Indigenous struggle as something of the past—it has been, it is here, and will continue to be here until we recognize it as our struggle too. This is a call for you. Organize! Join Raza groups! Join Student Groups! Create your own consciousness-building collective! Spread the word through your social media; your family, peers, friends, Gente; travel the far corners and yell #Ayotzinapa43Vive!